Yesterday I pondered the possibility of effectively losing God and / or the preacher from the preaching event. Today I’ll complete the scene by pondering the potential omission of the listener, as well as the critical fourth element of the Preaching Triangle. And when we fail to emphasize relevance to the listener? Then we have an historical lecture, a pulpit performance to impress God (it doesn’t), or a demonstration of the preacher’s theological acumen, but we do not have transformational Christian biblical ministry. Bible. The Bible is the self-revelation of a wonderful communicator. God inspired every word, every choice of genre, etc., and so we should seek to honour His work by doing our best to understand His Word and re-present it to others. The Bible should not be an end in itself, but the means by which we can know the heart of God: His personality, His loveliness, His values, His concerns, His delight. And when we omit the Bible? Then we have personal opinion, or implied direct revelation (highly questionable), but we do not have authoritative Christian biblical ministry. Why might the preacher fail to pay attention to the listener in the preaching event? Perhaps too much self-focus, perhaps a lack of understanding that communication needs to be aimed to fully arrive, or perhaps a lack of concern for others. And why might the Bible get lost in the mix? Again, numerous possible reasons: a faulty view of direct revelation, an elevated view of one’s own wisdom or spirituality, an inadequate view of the Bible, or even a lack of care for the listener’s real needs. 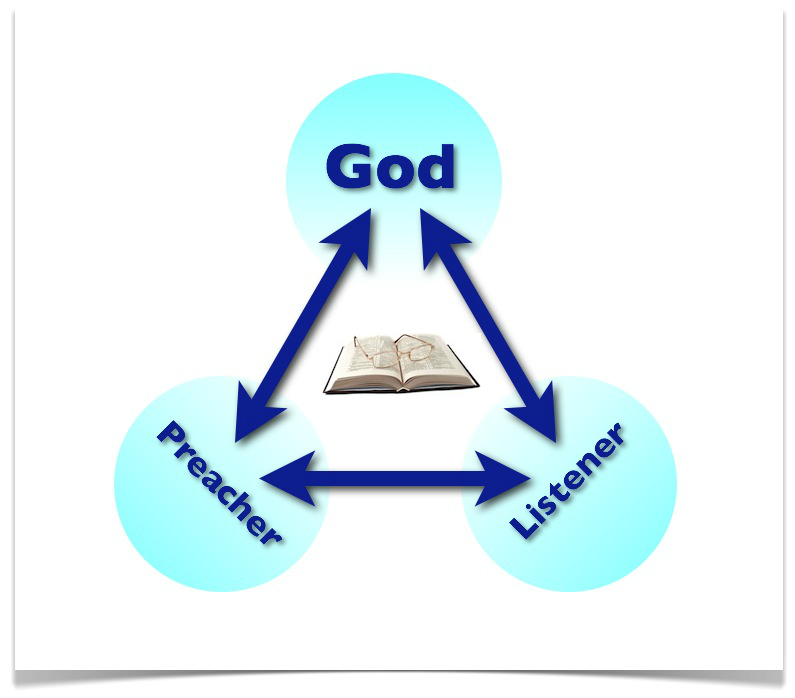 Tomorrow I’d like to start considering the relationships implied by this Preaching Triangle.